Place of Birth: Islington, London, England, U.K. 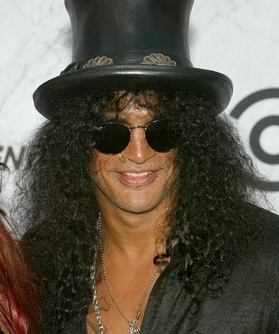 Slash is a British and American musician and songwriter. He was born in Islington, London, England, to an African-American mother, Ola Jorjan (Oliver), and a white English father, Charles Anthony Hudson. His family moved to California when he was eleven years old. Slash has two children with his wife, Perla Ferrar. Slash has sometimes been described on the internet as having Nigerian or Jewish ancestry. Both claims are inaccurate. Slash is the guitarist in the band Guns N’ Roses. Other members of the band include or have included Steven Adler, Duff McKagan, Melissa Reese, Axl Rose, Matt Sorum, and Izzy Stradlin. Slash was also a member of hard rock supergroup Velvet Revolver, along with Dave Kushner, Duff McKagan, Matt Sorum, and Scott Weiland. Slash’s patrilineal ancestry can be traced back to his fifth great-grandfather, George Hudson (c. 1788, Snelston, Derbyshire – December 1879, Derbyshire). Slash’s paternal grandfather was Charles Henry Hudson (the son of Charles Henry Hudson and Emma Burgess). Slash’s grandfather Charles was born in Stoke-on-Trent, Staffordshire. Slash’s great-grandfather Charles was the son of Charles Henry Hudson and Hannah Margaret Mills. Emma was the daughter of James Burgess and Hannah Cooke. Slash’s paternal grandmother was Sybil Young (the daughter of George Young and Eliza Eleanor Bracegirdle). Sybil was born in Stoke-on-Trent, Staffordshire. George was the son of Charles Young and Martha Walker. Eliza was the daughter of William Bracegirdle, whose own mother, Elleanor Roberts, was Welsh, and of Mary Fletcher. Charles’ middle name is Henry, and he was born in Stoke-on-Trent, Staffordshire. He was the son of Charles Henry Hudson and Emma Burgess. Slash’s great-grandfather Charles was the son of Charles Henry Hudson and Hannah Margaret Mills. Emma was the daughter of James Burgess and Hannah Cooke. Sybil was born in Stoke-on-Trent, Staffordshire. She was the daughter of George Young and Eliza Eleanor Bracegirdle. Slash’s great-grandfather George was the son of Charles Young and Martha Walker. Eliza was the daughter of William Bracegirdle, whose own mother, Elleanor Roberts, was Welsh, and of Mary Fletcher. Remark: Ancestry.com is suffering from a glitch, where you can see details even if you are not a subscriber for a brief period of time such as the link given above. Try to take this opportunity to expand the ancestries of other profiles. Hope some of our other contributors take advantage. Thanks for the tip. is this right or false that his mother had an affair with DAVID BOWIE ?